The Pound was once again the worst performer, falling against the US Dollar to 1.2772, its lowest level since Jan 15, ahead of another round of Parliamentary votes. The Sterling dived after PM Theresa May suffered another Commons defeat as MPs voted against a motion endorsing the government's negotiating strategy. The outcome is negative for the Pound as the internal division weakens May's capacity to negotiate with the EU. For today’s market sentiment, traders will shift their focus to January's Retail Sales, expected to have risen by 0.2% MoM and by 3.4% YoY. The Pound successfully broke below 1.12830 which means the bears are now looking at 1.2730 for their next possible destination. 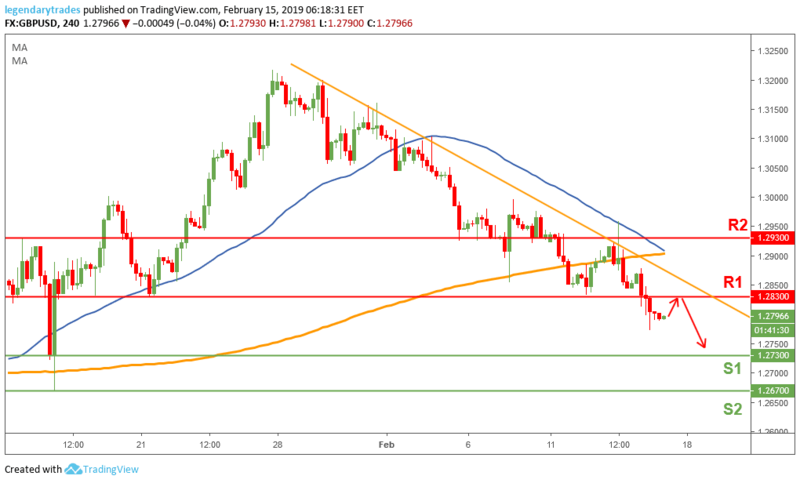 A break below 1.2730 (S1) could take price towards 1.2670 (S2).